everyday tasks, streaming music and movies, taking photos, checking emails, and engaging with social media. 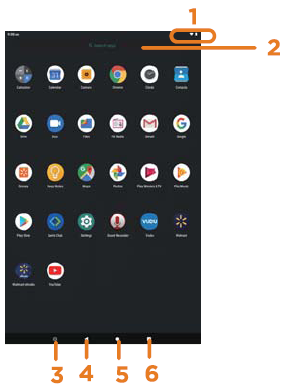 The tablet offers 16GB of internal storage, Bluetooth connectivity, Micro SD slot for up to 128GB of additional storage,on-the-go productivity services, and a utility app. The following information will help you get the most out of your tablet. • Charge the battery completely before first use. • Close unused applications. 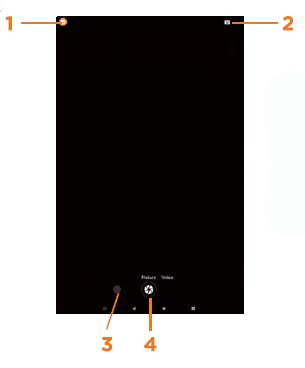 Open apps that run in the background will affect overall performance. • Battery Consumption: Play times on a fully charged battery will vary depending on your display settings, apps that remain open, and internet use (ie: streaming video content). 1 -Read these instructions-All the safety and operating instructions should be read before this product is operated. 2.Keep these instructions-The safety and operating instructions should be retained for future reference. 3.Heed all warnings-All warning on the appliance and in the operating instructions should be adhered to. 4. Follow all instructions-All operating and use instructions should be followed. 5.Do not use this apparatus near water-The appliance should not be used near water or moisture-for example,in a wet basement or near a swimming pool,and the like. 6.Clean only with dry cloth. 7.Do not block any ventilation openings. Install in accordance with the manufacturer’s instructions. 9.Do not defeat the safety purpose of the polarized or grounding plug. A polarized plug has two blades with one wider than the other.A grounding plug has tow blades and a third grounding pr g. The wide blade or the third prong is provided for your safety. If the provided plug does not fit into your outlet. 10.Protect the power cord from being walked on or pinched particularly at the plugs,convenience receptacles,and at the point where they exit from the apparatus. apparatus.When a cart or rack is used.Use caution when moving the cart/apparatus combination to avoid injury from tip-over. 13. Unplug the apparatus during lightning storms or when unused for long periods of time. 14.Refer all servicing to qualified personnel.Servicing is required when the apparatus has been damaged in anyway,such as power supply cord or plug is damaged liquid has been spilled or objects have fallen into the apparatus has been exposed to moisture,does not operate normally,or has been dropped. 15.CAUTION:These servicing instructions are for use by qualified service personnel only. To reduce the risk of electric shock,do not perform any servicing other than that contained in the operating instructions unless you are qualified to do so. 18.WARNING:The mains plug is used as disconnect device,the disconnect device shall remain readily operable. 19.WARNING:To reduce the risk of fire or electric,do not expose this apparatus to rain or moisture. The apparatus shall not be exposed to dripping or splashing and that objects filled with liquids. Such as vases,shall not be placed on apparatus. 20.-This lighting flash with arrowhead symbol with in an equilateral triangles intended to alert the user to the presence of non-insulated”dangerous voltage” within the product’s enclosure that may be of sufficient magnitude to constitute a risk of electric shock. -Warning: To reduce the risk of electric shock,do not remove cover(or back)as there are no user-serviceable parts inside.Refer servicing to qualified personnel. -The exclamation point within an equilateral triangle is intended to alert the user to the presence of important operating and maintenance instructions in the literature a accompanying the appliance. 21. 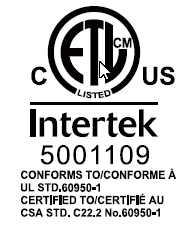 Warning: Please refer the information on exterior bottom enclosure for lectrical and safety information before installing or operating the apparatus. Use the devices where the ambient temperature is between 00 and 350 (320 to 950 F). Low- or high-temperature conditions might cause the device to change its behavior to regulate its temperature.Using Android device in very cold conditions outside of its operating range might temporarily shorten battery life and could cause the device to turn off. Battery life will return to normal when you bring the device back to higher ambient temperatures. Using an the devices in very hot conditions can permanently shorten battery life. 2. At the Start-up screen, slide your finger up to unlock. 3. Once you’ ve arrived at the Home screen, you can begin using your tablet. NOTE: To perform an update, you must be connected o WiFi. The first time you sign on to Google Play Store, updates will automatically start downloading on to the tablet. 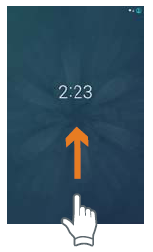 The download icon will appear in the status bar at the top left of screen . Installing a new application while multiple apps are downloading will reduce tablet speed and performance. After all downloads and updates have been installed, the tablet will resume normal ope rating performance. To view the progress of downloads working in the background, slide your finger down from the top edge of the screen. • A wireless router or an access point with a broadband internet connection. if your network is secure. The wireless router must support WiFi 802.1 la/b/g/n connections. Go to SETTINGS > Network & internet > WiFi Tap on WiFi to activate wireless connectivity. The Tablet will scan for available WiFi networks within range. Secured networks will require a password, Once you have successfully entered your information the tablet will remember your settings. 1 ) Turn on the compatible Bluetooth device and make it discover able. 2) Open the Settings > Connected devices. 3) Tap on Pair new device view available devices. tablet, plug the 1) USB cable into the AC adapter, and 2) attach the other end to the Micro-USB input on the tablet. 3) Plug the AC adapter in to a wall outlet. When the tablet is ON and cha rging, the battery icon will pulsate. A complete battery charge may take up to 2.5 hours. It is normal for the tablet to get warm while charging, playing high in tensity games, or streaming video. Battery life will vary depending on usage. Note: Leave tablet in well ventilated area while charging. We would like you to have a safe and enjoyable experience. 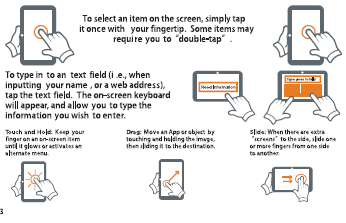 Please read the following instructions and notices before using your tablet. •Warning: This product may contain a chemical known to the State of California to cause cancer, birth defects, or other reproductive harm. • Avoid using the tablet in extremely hot, cold, dusty, damp or wet environments. • The tablet is not moisture/water•resistant. Avoid using the tablet around sources of water, Avoid dropping or forcibly placing the tablet onto a hard surface. This may damage the screen or internal electronic components and void the warranty. • Do not use alcohol, thinner or benzene to clean the surface of the tablet. Use only cleaning products designed for computer tablet devices. • Do not use the tablet while walking or driving. • Excessive use of earphones at high volume may lead to hearing impairment. Limit earphone usage, and adjust the volume to a moderate level when doing so. • The images in this guide may vary slightly from the actual product. 1. The battery level icon indicates low power, by showing a drained, red battery icon. 2. The tablet powers-off automatically, and continues to do so even after restarting. 3. On-screen keys do not work. • Dismantling the tablet will void the manufacturer* s warranty. 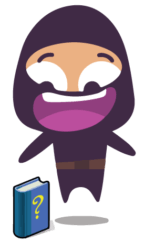 If you are experiencing problems, review the Troubleshooting section of this manual. • The tablet functions, hardware, software, and warranty information may be improved or modified by the manufacturer or their respective owners, and is subject to change without notice. This device complies with Part 15 of the FCC Rules, Operation is subject to the following two conditions: (1) this device may not cause harmful interference, and (2) this device must accept any interference received, incl uding interference that may cause undesired operation. 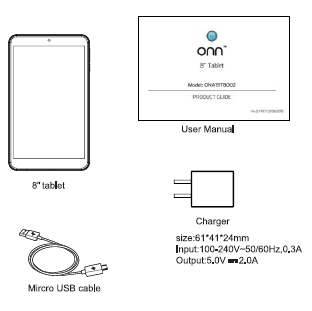 Questions about your Onn 8″ Tablet ? Post in the comments!